In May of 1992 I turned 10 years old. For my birthday I got a CD/tape player/radio/boombox and several CDs - Endless Summer by the Beach Boys, Please Hammer Don't Hurt 'Em by MC Hammer, a 50s compilation, and the soundtrack to the Teenage Mutant Ninja Turtles movie. That same month, Spawn debuted in Image Comics' Spawn #1 by Todd McFarlane. Dare I say it, none of the things I've mentioned have aged well at all - except maybe Mr. McFarlane (and I'm including myself on that list). Spawn's enduring legacy as a character is in spite of his origins, not because of it. Look at Spawn as he was created and it's apparent which era of comics he was born from. The massive, flowing cape. The oversaturated colors. The skull and chain motif. The gritted teeth. The complete lack of subtlety in the writing. The very nature of the Hell-borne being seeking vengeance. I would go so far as to state that Spawn is the quintessential 90s comic book creation - for a being from Hell, I will damn him once again, this time with faint praise. If you take Spawn at face value, it's hard to determine exactly how he's managed to remain relevant 26 years later. As pop culture has evolved and society's tastes have matured (ever so slightly - and even then not completely), there's no way a character like this would be created today. So why are we still talking about him? Spawn's lack of dimensionality is the very thing that gives his creators so much freedom. The fascinating thing about Spawn isn't Al Simmons himself, but the interactions and stories that happen around him. Writers like Alan Moore and Neil Gaiman, Grant Morrison and Robert Kirkman, Dave Sim and Frank Miller - all of them wrote amazing tales set in the Spawn universe, and Spawn was probably the least interesting part of all of the stories. Spawn is the Mad Max of his universe - all the interesting stuff happens around him or to him, but not by him. Spawn is almost akin to a blank slate, giving artists room to invent a wonderful world that can be manipulated however they see fit - all they have to do is make sure the guy in the cape and chains is in there somewhere. It's telling that for the past several years, McFarlane has spoken of his Spawn film as a comparison to Jaws - the title character is barely seen. Whether this will come to fruition with a marquee name like Jamie Foxx remains to be seen. 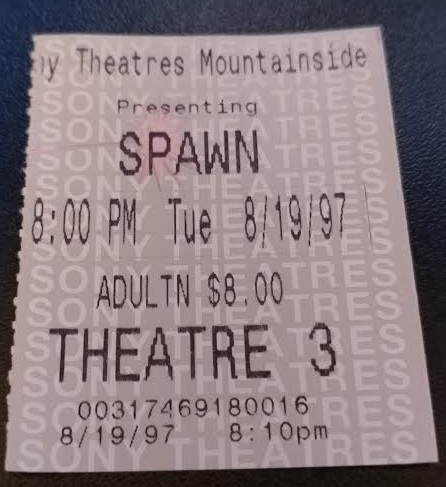 (Frankly, whether this entire production will come to fruition remains to be seen - this version of Spawn is reaching Half-Life 3 levels of hype. Let's hope it's not the Chinese Democracy of movies.) But the description of his film centers not around Spawn, but around Twitch (and hopefully Sam as well) - the two most interesting characters in the Spawn universe. If I had my druthers, I'd make a Sam & Twitch film with a Spawn cameo. But I'm not a bigshot Hollywood producer, and when it comes to basing film productions off my viewing habits, well... the ticket above speaks for itself. Lest you think I intended to spend this entire blog bashing the basis for this week's episode, let me say that the artwork in this comic, 90s design aside, has its upsides. For all the hatred I throw on the aesthetic of the 90s, it still appeals to that 10 year old in me to see a guy in a cape punching demons and ripping their organs out. And the Violator would make a cool video game boss - you can finish him by ripping his lower jaw off and beating him with it. So it's perfectly alright to enjoy Spawn for what it is, as long as you understand that he will forever be stuck in the 90s. We're over 25 years later, 200+ issues and several spinoffs, an animated series, one feature film (and potentially another to come), and we're somehow still talking about Al Simmons. Kudos to Todd McFarlane for creating a character that has embedded himself in a small corner of the zeitgeist, no matter what has happened in the interim since his debut. Now if you'll excuse me, I think I need to listen to the Turtles soundtrack again - I'm in the mood for some Turtle Power. Call it nostalgia, but the 10 year old in me is hungry for pizza.